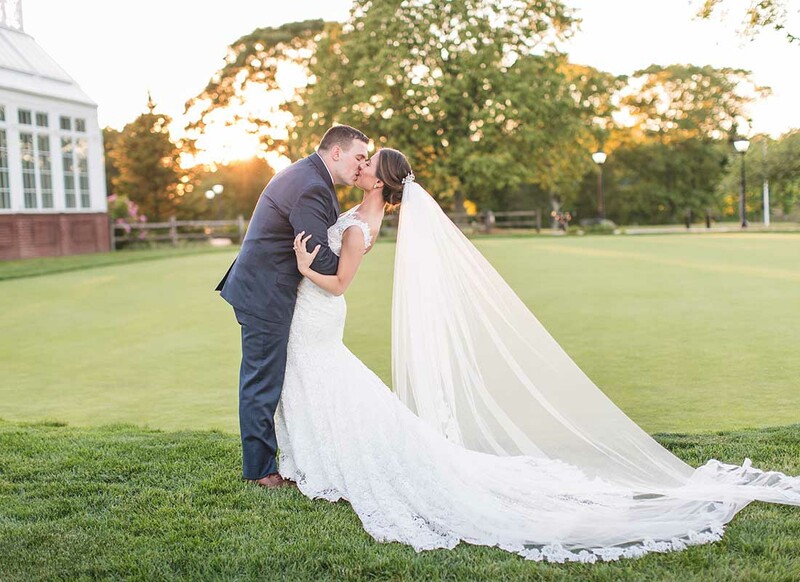 For Jaclyn and Patrick Gaffney every little detail came together on June 3, 2017 at the Carlisle on the Green in Farmingdale, New York to create the Tuscan-inspired wedding of their dreams, from the hanging centerpieces, to the “secret garden-esque” décor, and of course the wedding gown of Jaclyn's dreams. 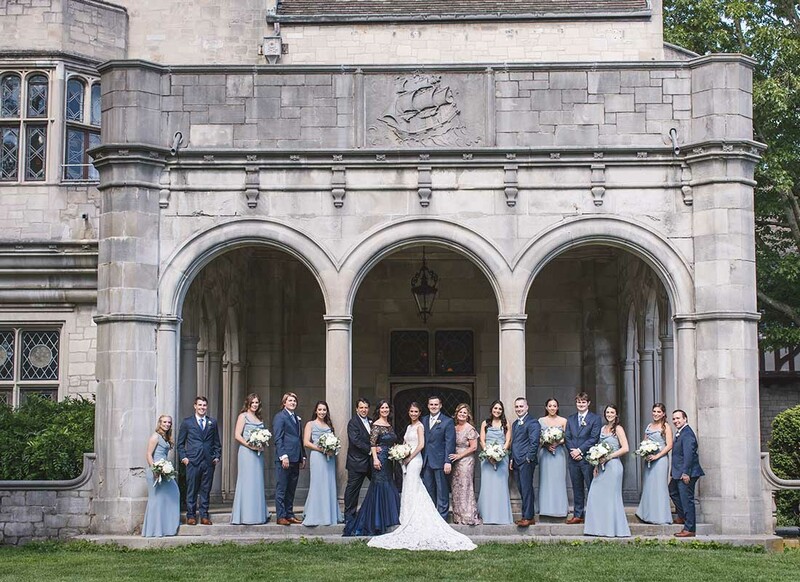 Customized to fit her unique style, Jaclyn walked down the aisle in a gown that was uniquely her. 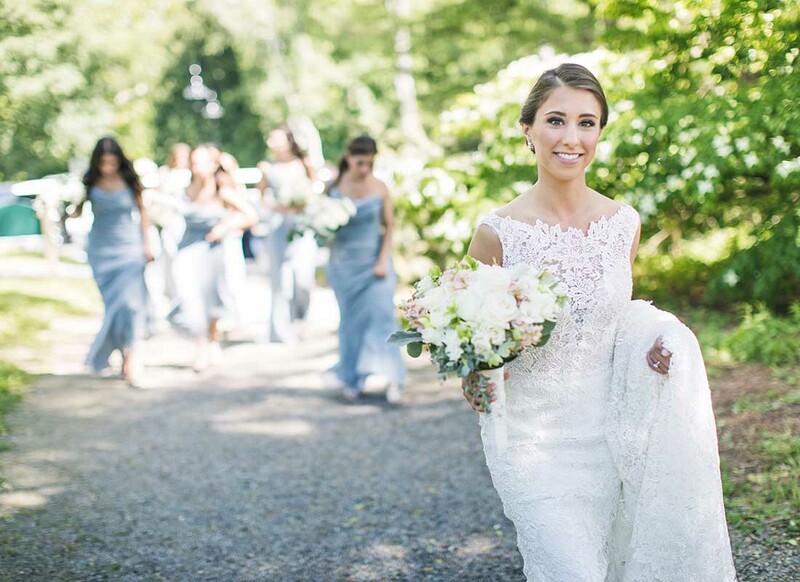 By the time Jaclyn and her shopping crew made their way to Kleinfeld Bridal, Jaclyn had already changed her mind on what she thought she wanted. 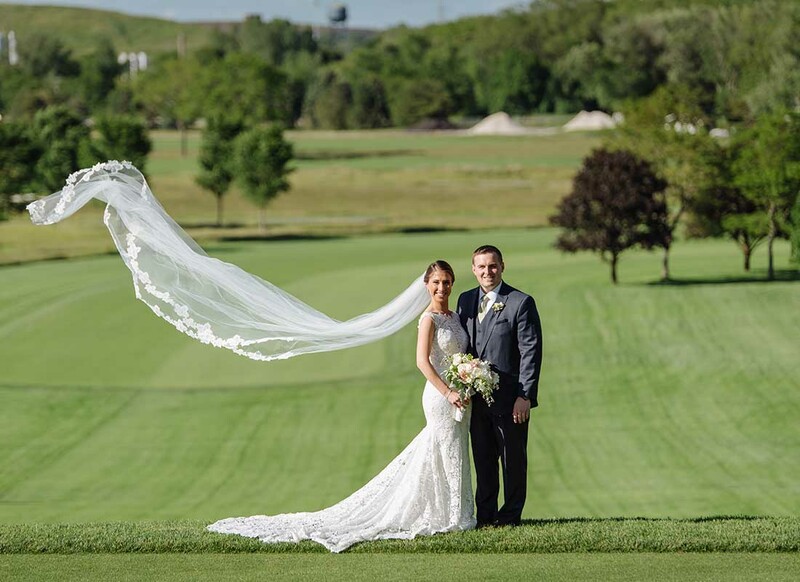 The only thing Jaclyn knew that her gown absolutely had to have was lace. However, despite trying on many lace gowns, Jaclyn had yet to find the exact lace she was looking for. 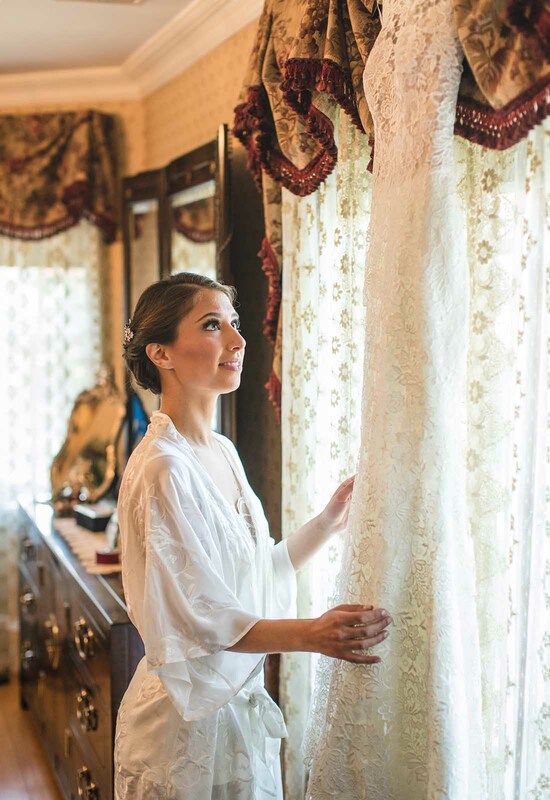 While Jaclyn tried on gowns, her future mother-in-law wandered around the famous salon and grabbed a lace gown that she thought Jaclyn would love. Jaclyn agreed to try on the gown and the rest is history. Immediately Jaclyn could tell that this gown was made of the lace that she had been searching for. 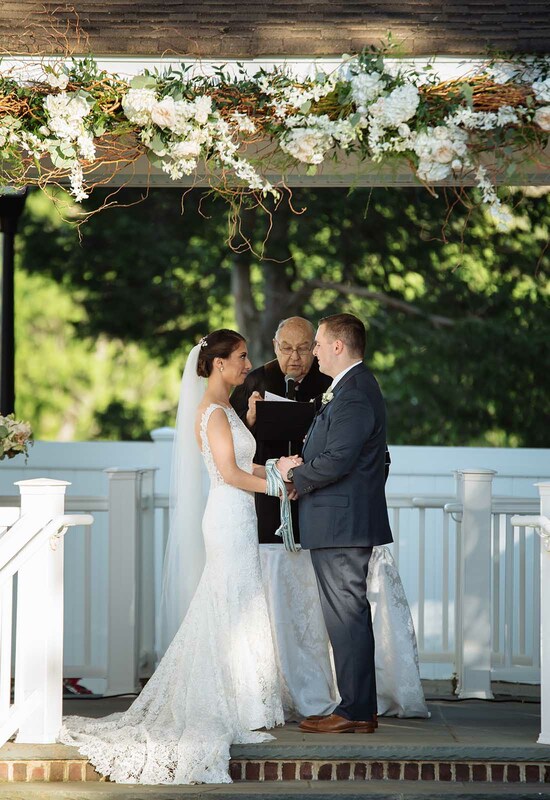 Jaclyn's future mother-in-law had brought her a Pnina Tornai, Guipure lace, sheath gown with a sweeping train and V-neckline. 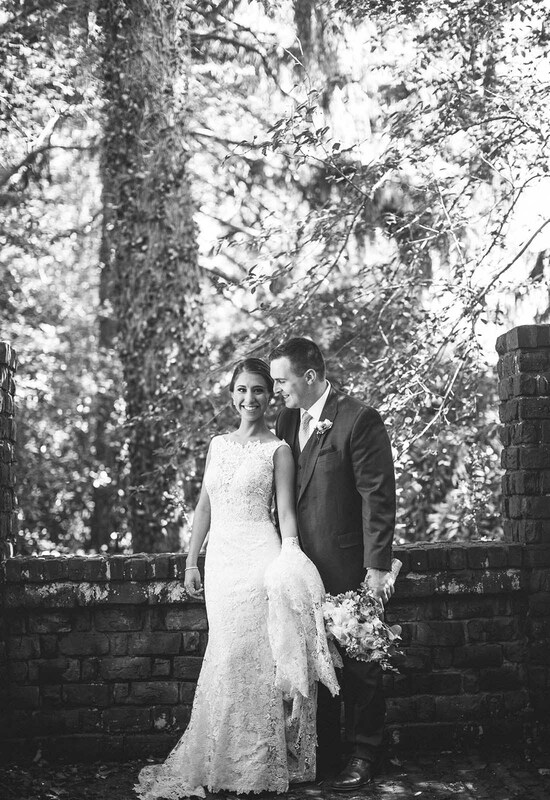 From the moment Jaclyn slipped into the lovely lace gown, she was in love. 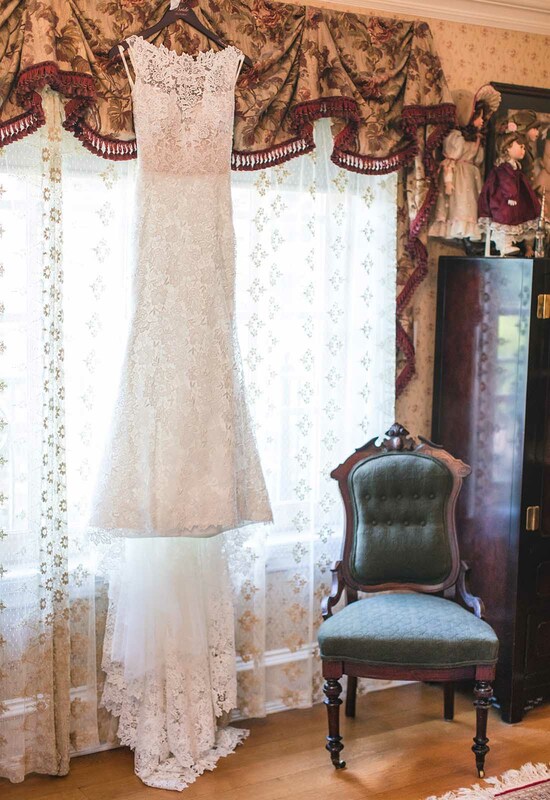 The Guipure lace was exactly what she had been looking for. Thick with a vintage feel, this lace was like no other. While the lace was spot-on there were some changes that Jaclyn wanted to make before the gown was made perfect. Much to her delight, Pnina Tornai is a designer who loves customizing gowns and makes it easy for brides to customize as they see fit. Therefore, in the dressing room, Jaclyn's consultants were helping her visualize what the gown could be. 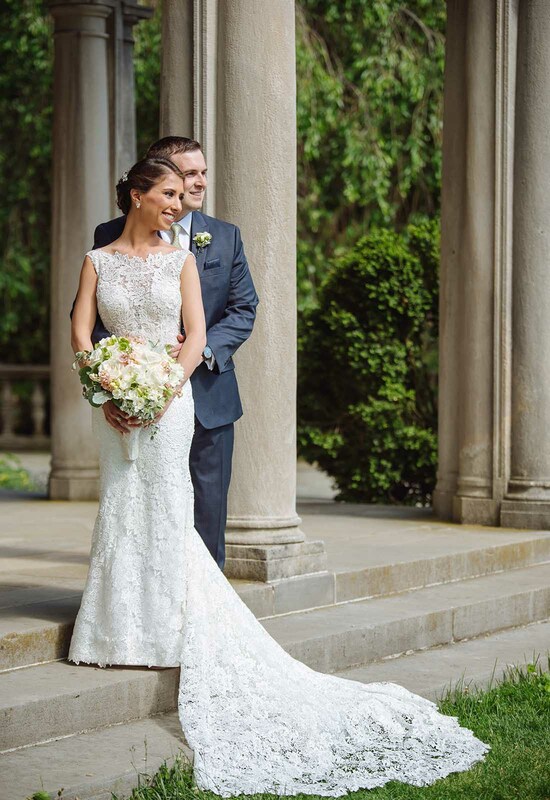 Knowing that she could customize the gown to fit her dream, Jaclyn said yes to the dress! For the customizations on her gown, Jaclyn actually got to sit down with Pnina Tornai who sketched out the gown for her. 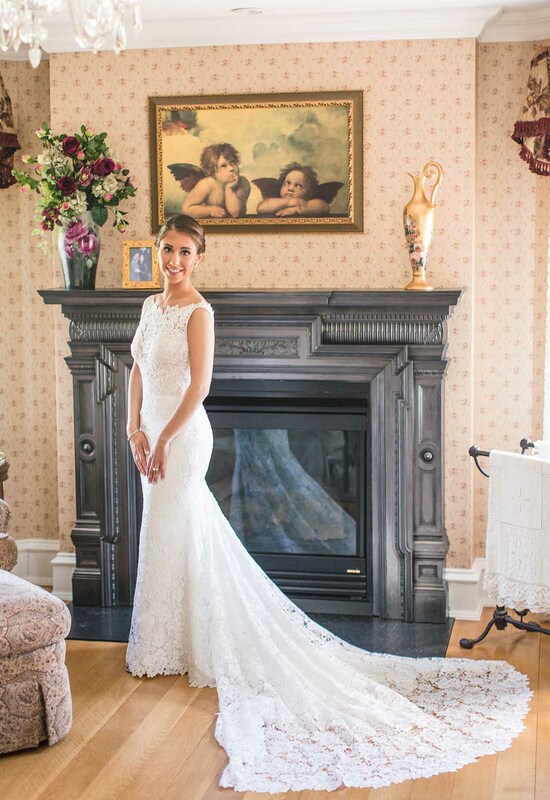 Fun fact: Jaclyn has the sketch of her wedding dress framed and hanging in her home now. For starters, Jaclyn desired a different neckline. To fit her retro sense of style, Jaclyn opted for a bateau neckline. 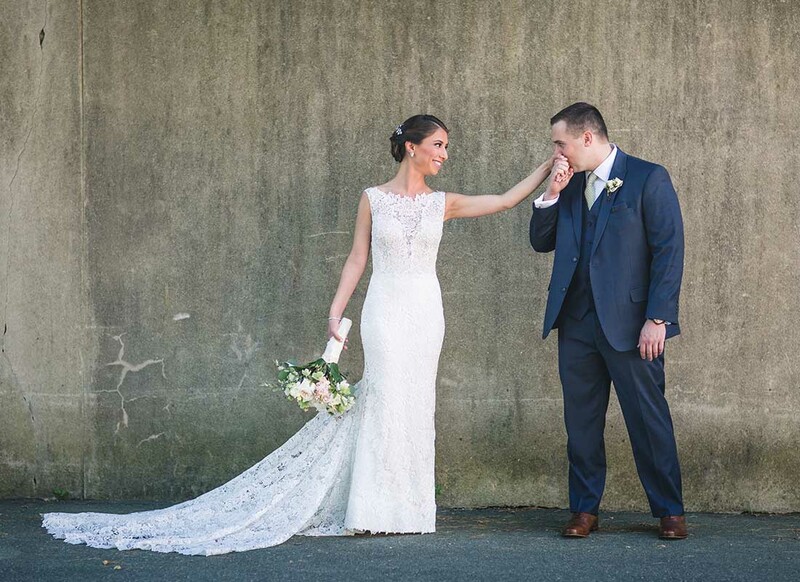 Pnina used more of the same lace from the gown to achieve this look. Next, since Jaclyn leans more towards the conservative side, she had the low back raised so that it wasn't so low, but still open enough to not overwhelm her small frame. 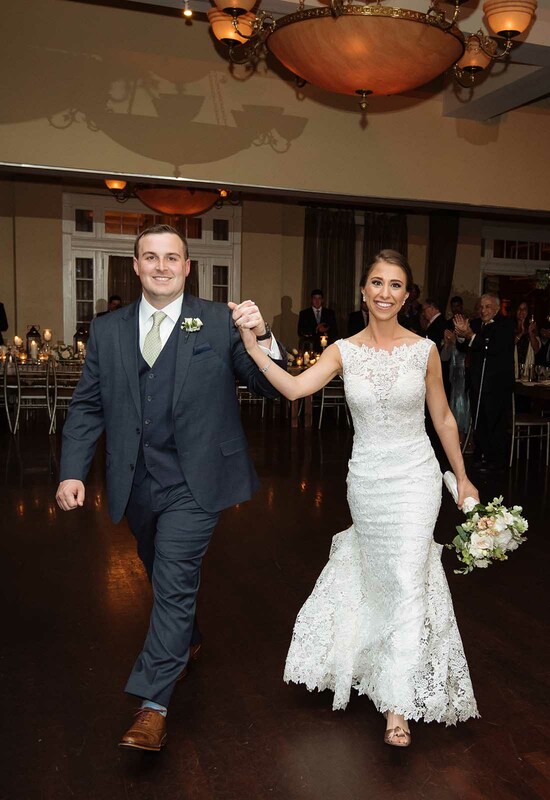 With all the changes made it was finally time for Jaclyn to see her dream gown come to life. “When I saw it (the dress) finally I cried a little bit because it was perfect,” Jaclyn reminisces. 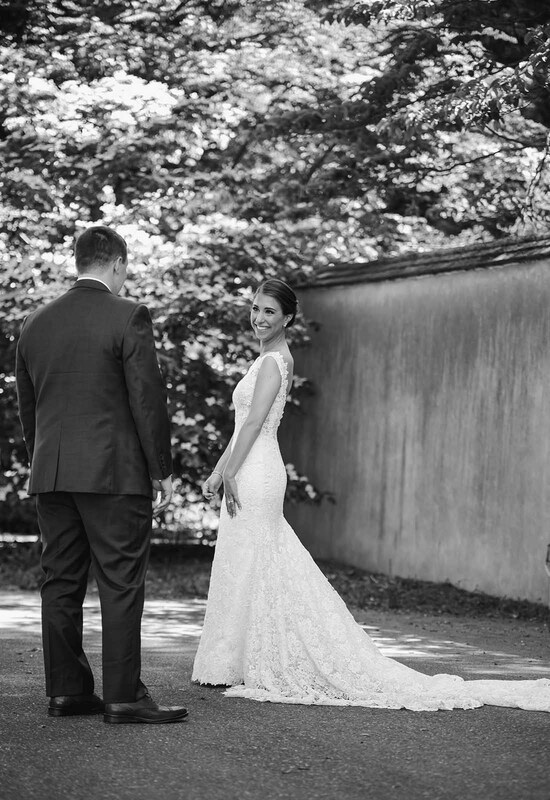 The finished product was an enchanting Guipure lace, sheath gown with a bateau neckline, open back and cathedral length train. This gown was definitely a head-turner! 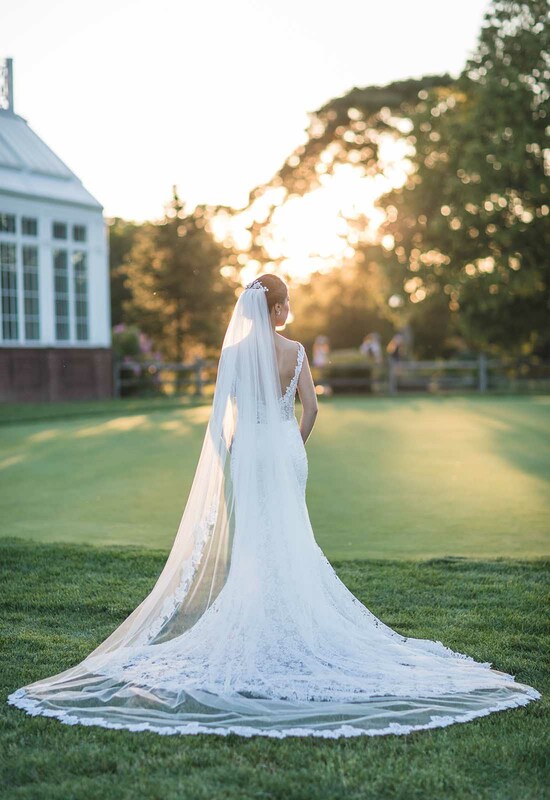 “I'm not a showy or revealing person, but I wanted to stand out because it was my wedding day,” Jaclyn explains. 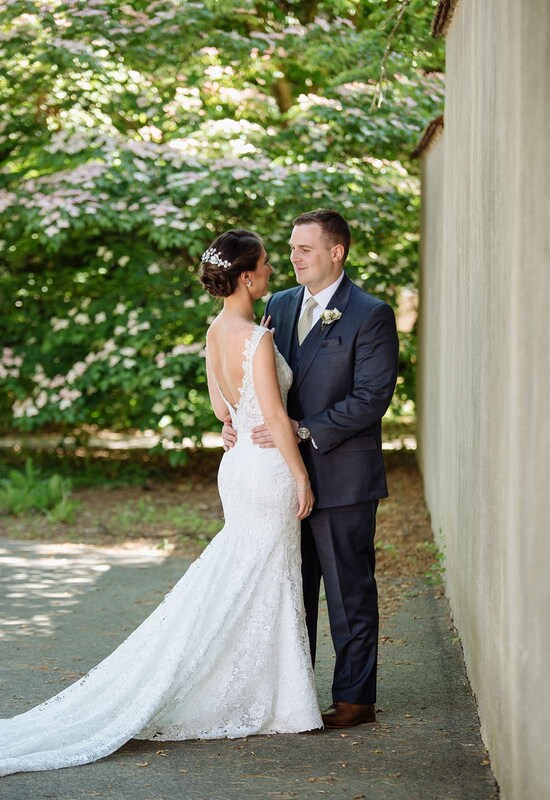 To compliment her now perfect wedding dress, Jaclyn wore her hair in an elegant up-do with a shimmering crystal headpiece. 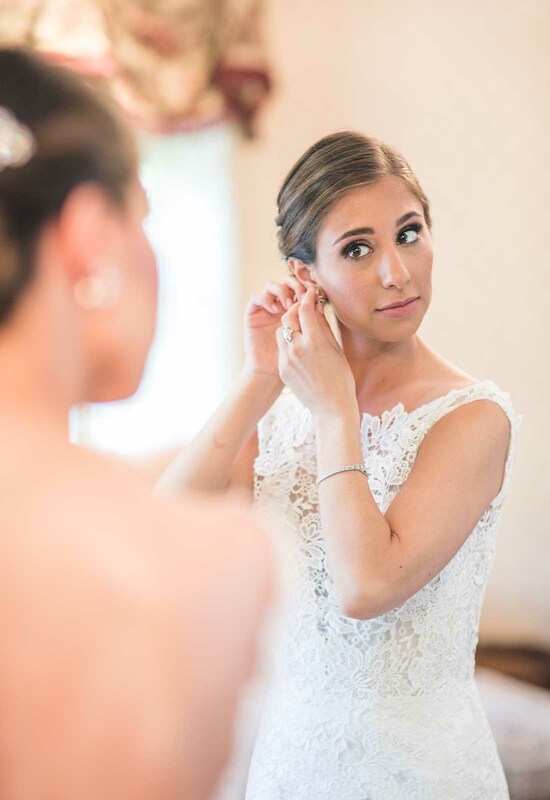 She also wore gorgeous diamond and pearl earrings that had been passed down from her grandmother and worn by the women in the family on their wedding days. Lastly, Jaclyn wore antique bracelets and rings from the 1920's that had a wonderfully art-deco vibe to them. 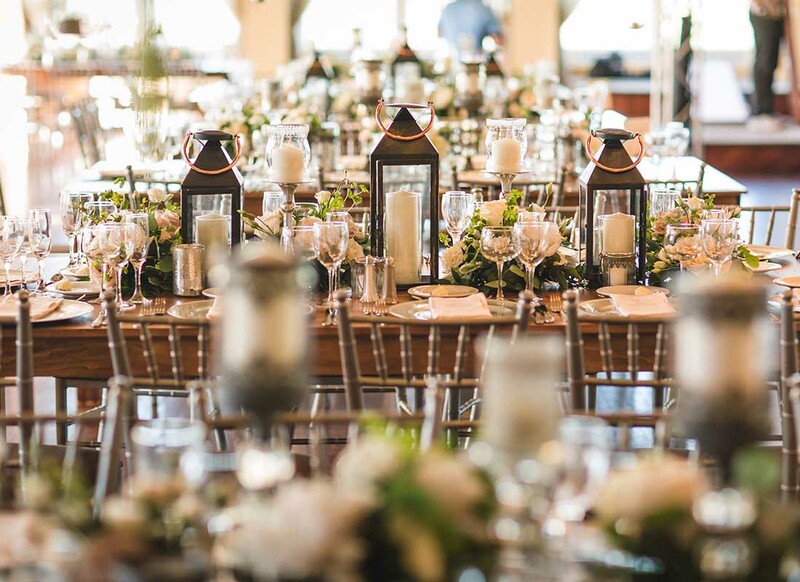 When it came time for Jaclyn's wedding day, the scene was set. 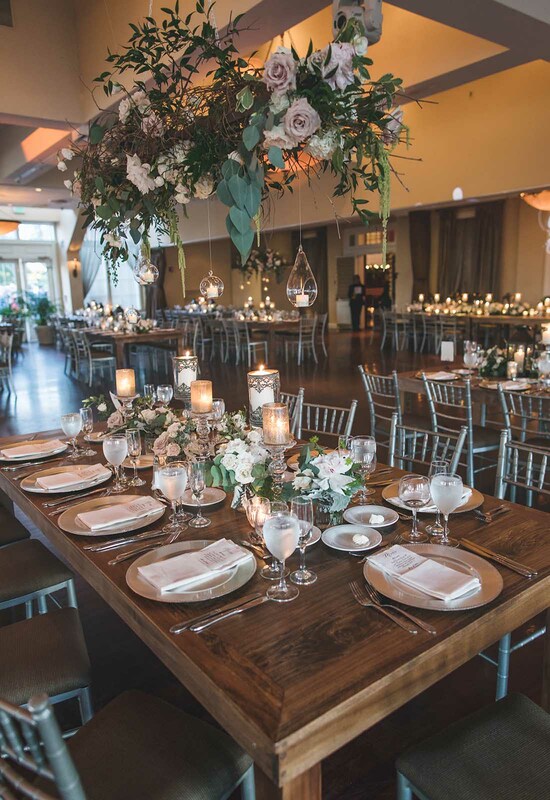 From rosemary olive oil infusers to hanging floral centerpieces, everything was ready for Jaclyn and Patrick's special day. 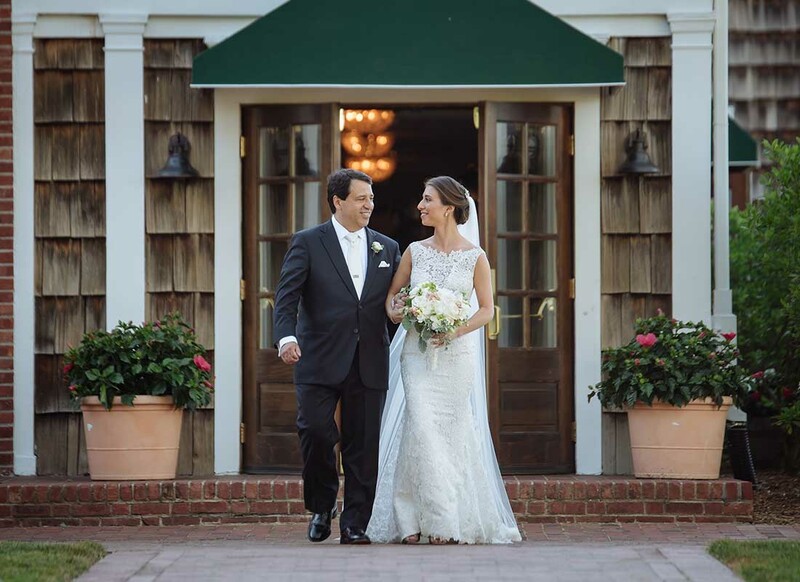 Glowing with self-confidence in her one-of-a-kind gown, Jaclyn walked down the aisle to say her vows to the man she loves. 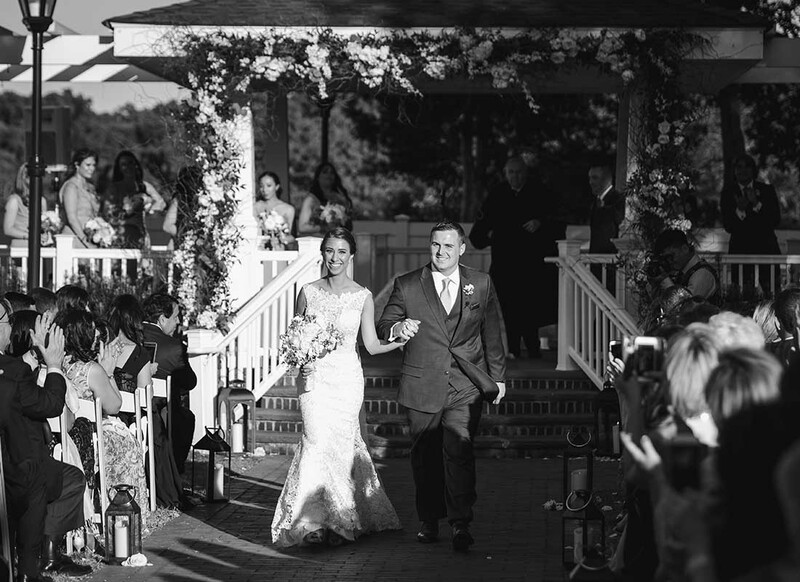 This day was everything she had dreamed of and more down to the last detail, including her gown. 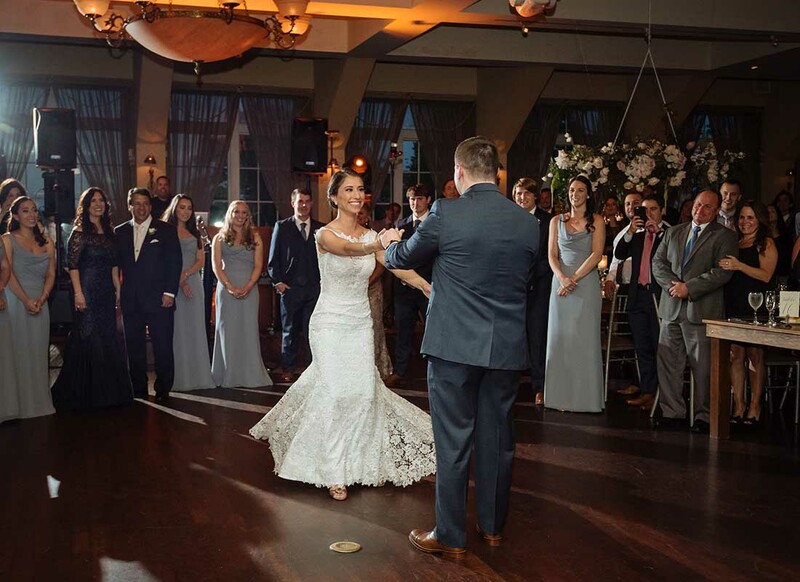 Finally, bustling the back of her exquisite train for the reception, Jaclyn danced the night away in newly wedded bliss.